Having heard folk metal that originates mostly from scandinavia (bands such as Ensiferum, Moonsorrow, etc. ), it was interesting to hear what folk metal from these “non-native” countries sound like. Bands such as Eluveitie and Equilibrium instantly come to mind as successful non-scandinavian folk bands. Bolero hails from Canada, where war metal bands (in the veins of Blasphemy, Revenge and Conqueror) are more common. Fortunately, Bolero doesn’t disappoint, with the unsuspecting listener easily lumping them with the Finnish and Swedish folk metal bands, with the melodic death metal influenced brand of folk metal. Right from the start, songs such as Send of the War Summons bring bands like Ensiferun to mind, with the heroic riffs and the growls that are reminiscent of the Victory Songs album. On parts with clean vocals, Turisas‘ fun take on folk and battle metal instantly come to mind, without compromising the quality and enjoyability of the music. Fortunately, unlike Ensiferum‘s current frontman Petri, vocalist Morgan is able to belt out his vocals effortlessly. Songs such as Pint Held High brings Korpiklaani to mind, with the drinking theme, with the only difference being the rough vocals and the music that resembles Finntroll‘s Nattfödd album. On the softer parts of the album the band also doesn’t forget to keep up the heroic feel and emotion of the album. For example, the interlude Our Land, Our Seas, Our Skies gives listeners a sense of standing atop a mountain and breathing in the cold air, enjoying the majestic view that lays beneath, the lands that one has yet to conquer. The band also makes use of the usual sound effects that folk metal bands tend to use, such as the sound of battle on Risen Victorious and the sound of water splashing against the shore on O’ Hail the Northlander. On the latter track, the sudden break in the music at 3:15 almost reminds listeners of thrash metal, another display of their wide range of influences while writing their music. The only disappointing moment on the album is the acoustic A Silence Prolonging, which gave rise to an awkward moment especially after the energetic Throne of Storms. While the instrumentals could have been a good break in between songs, the low vocals felt slightly awkward and it seems that Morgan is more suited for the higher, heroic styled vocals instead. Fortunately though, this is the only song where he utilises such a vocal style. 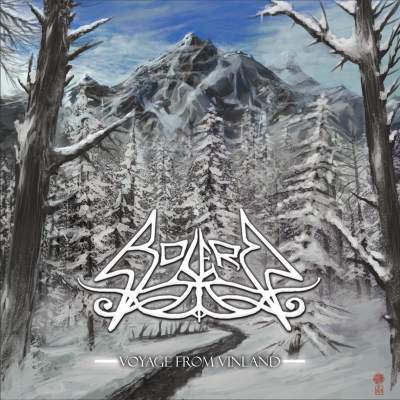 The interlude Way to Forgotten Lands while isn’t bad on its own certainly caused the listener to slightly lose patience, and hearing the band going back to their usual tempo on the closing track Sworn Under the Winter’s Majesty was certainly refreshing. Voyage from Vinland is an extremely enjoyable album, and it certainly brings back memories of my first encounter with bands such as Ensiferum, with the catchiness and the heroic feel of the music. While nothing particularly new, it does provide a refreshing look at the whole host of metal bands that come out of Canada.